Bart Reiter Whyte Laydie Model 5 String Banjo (1994), made in Lansing, Michigan, serial # 1159, natural lacquer finish, laminated maple rim and neck, ebony fingerboard, original black tolex hard shell case. Overall length is 36 3/4 in. (93.3 cm. ), 11 in. (27.9 cm.) diameter head, and 2 3/4 in. (7 cm.) in depth, measured at side of rim. Scale length is 26 in. (660 mm.). Width of nut is 1 5/16 in. (33 mm.). This lovely banjo has some minor wear overall; it has been played but not abused and remains nicely original and an excellent sounding openback. There are small finish dings and chips and some light tarnish to the plating. The back of the neck shows wear down to the wood in the first position. There is light finish checking on the headstock and a small chips around the tuners and on the top edge next to the lowest tuner. A single railroad spike has been added at the 7th fret position. This instrument plays and sounds excellent; it hardly seems over 25 years old already! Bart Reiter, one of the finest banjo makers of recent times, no longer builds this lovely Fairbanks-inspired Whyte Laydie style instrument. 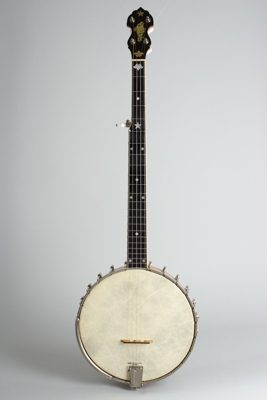 This very nice and relatively early example of a very classy modern old-time banjo is now only available used, already slipping into history! Excellent - Condition.